The PUEBLO WHITE 80" TV Stand by International Furniture Direct at Miskelly Furniture in the Jackson, Pearl, Madison, Ridgeland, Flowood Mississippi area. Product availability may vary. Contact us for the most current availability on this product. Finish White Antique finish on distressed wood- six step hand rubbed finish. Top features a medium brown stain. Featuring selected pine wood on tops and hand wrought iron throughout, this collection will offer an updated, trendy configuration in a comfortable, rustic look to your home. 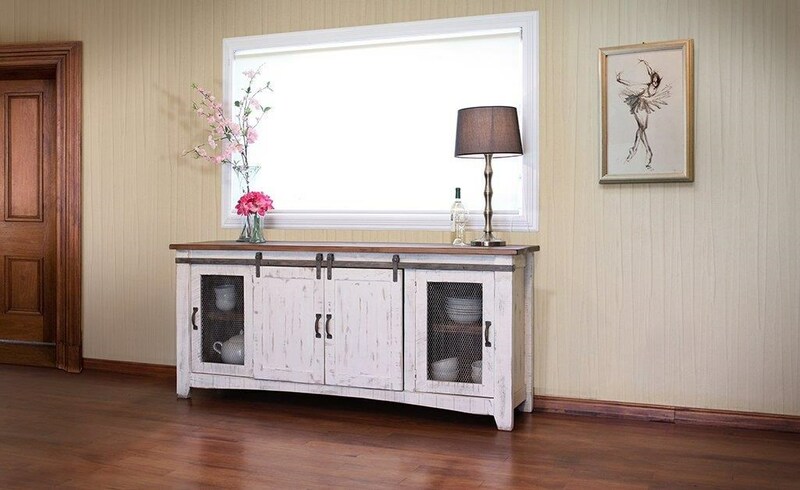 The PUEBLO WHITE collection is a great option if you are looking for Rustic furniture in the Jackson, Pearl, Madison, Ridgeland, Flowood Mississippi area. Browse other items in the PUEBLO WHITE collection from Miskelly Furniture in the Jackson, Pearl, Madison, Ridgeland, Flowood Mississippi area.